Indoor pool, cardiovascular equipment and weights. Please be aware that this is a 100% non-smoking hotel. The Hilton boasts bright and airy rooms decorate in cool, calm colours with high speed internet access, a desk and working area and flat screen TV with on-demand movie service. Accessible rooms are available. Please call our reservations team to discuss your requirements. The Edinburgh Airport Hilton has an indoor pool, cardiovascular equipment and weights. 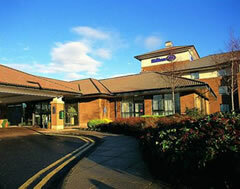 Just one of the many Hotels near Edinburgh Airport available from FHR. You will receive a separate confirmation for your parking with ACE Meet and Greet. Follow directions to Edinburgh Airport. The hotel is on the right as you approach the main terminal building. Please be aware that the Hotel is a 100% non-smoking hotel. Edinburgh Airport is a 10 minute walk from the hotel. A complimentary shuttle bus runs from 3:00am - 10am every 15 minutes. Call reception to request outside these times. At the airport, walk to drop off/pick up point to bus stop number 10. From the City Centre: Follow directions for the M9 which will take you on to the A8 out of the City Centre. You will pass Murrayfield Stadium on your left, Edinburgh Zoo on your right and the Gyle Shopping Centre. Follow directions for Edinburgh Airport, the hotel is located on your right hand side once you enter the airport grounds. From the M8/M9: If you are travelling on the M9, join the M8 and take the last junction which is the Newbridge exit. Follow directions for Edinburgh Airport, the hotel is located on your right hand side after you enter the airport grounds. The nearest train station is Haymarket and is located 7 miles from the hotel, available transport links from the train station are either by bus or taxi. A taxi rank is located just outside the train station and will cost between £15 - £20. Alternatively an Airlink Bus (No. 100) runs from Shandwich Place every 10 minutes, the bus stops outside the hotel. Rates are £4.50 for a single or £9.00 for a return journey for adults and £2.00 single or £3.00 for a return journey for children. Waverley station is located 8 miles from the hotel, available transport links from the train station are either by bus or taxi. A taxi rank is located just outside the train station on Waverley Bridge and will cost between £15 - £20.00. Alternatively an Airlink Bus (No. 100) runs from Waverley Bridge every 10 minutes, the bus stops outside the hotel. Rates are £4.50 for a single or £9.00 for a return journey for adults, £2.00 for a single or £3.00 for a return journey for children. View all Edinburgh Airport Hotel options available from FHR.